Pasta is my ultimate comfort food. Tossed with all the random ingredients I crave at the time, sloppily served in a bowl with heaps of olive oil and savory, crunchy sprinkles. The summery lemon + harvest type of bowl is one of my absolute favorite. In my opinion you can never go wrong with lemon pasta! This recipe was born out of a visit to the farmer’s market, picking up all things green I could find. I’m guessing my body was craving magnesium rich food at the time? Or perhaps is was the early summer bliss that made me intuitively reach for those green, tender veggies typical for that season. Now we are a little bit further along summer, but you can still find all these ingredients at the market. 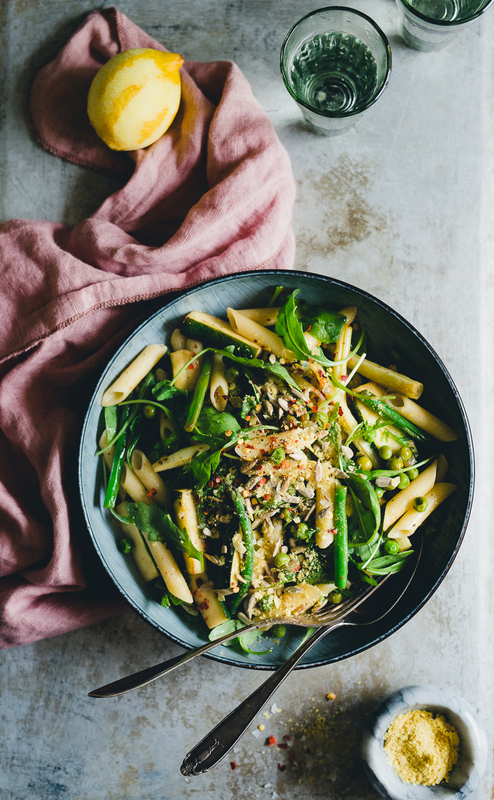 Back home I started prepping a huge pot of soft zucchini, crispy string bean and sweet pea pasta tossed with plenty of lemon and peppery arugula, for a handful of friends coming over later. Dinner was ready in under 20 minutes, and we placed the entire pot in the middle of the table and let everyone serve themselves. But eventually we all just stuck our forks straight into the pot :D Love those easy to share, one-pot meals! Fill a large pot with water and bring to boiling. Salt the water generously. Once water is boiling, cook the pasta according to the instructions on the packet. Let it be just a little ”al dente”, since we’re gonna sauté it briefly with the veggies later. Meanwhile, mince garlic and finely chop shallots. Dice zucchini and cut the string beans in half. Thaw the green peas gently in the microwave. Heat up a good glug of olive oil in a skillet and gently cook the onions until translucent. Add zucchini and string beans and cook on medium heat until slightly browned and tender yet with a little bite. Add more olive oil if needed. Add green peas, garlic and sprinkle with salt, pepper & chili flakes. Let cook on medium low heat for about 3 minutes. Add the pasta to the skillet, along with lemon zest, lemon juice, white balsamic vinegar, a little extra olive oil, salt & pepper if needed and toss to combine. Quickly sauté on medium high heat for a minute or two. Turn off stove and add the rocket salad. Toss to combine. Serve immediately in bowls, topped with toasted sunflower seeds and a sprinkle of nutritional yeast (or parmesan cheese if that’s your thing). Enjoy! Looking for more pasta inspiration? Here are some of my favorite recipes! Hey Agnes! This looks really good. I love any pasta dish and the easier the better! I will be sure to try this :) I should really put some of my pasta dishes on my blog too! Thanks for the recipe and inspiration. Hey! Thank you! Me too, it’s always my to-go in the weekdays when I feel a bit stressed but still need something comforting and delicious :-) Hope you like the recipe if you try it out! Love this simple recipe, thank you for sharing Agnes. I can’t wait to see and hear all about your trip to America. Glad you like it! :D In case you missed it, I’ve blogged about Seattle now, and Portland is in the pipeline ;-) Hope you’ve had an amazing summer! Thank you dear Agnes, I didn’t miss it, I loved every bit of it words and images. I guess I forgot to comment on it. Thank you I had a great summer just here and home, working on different photography projects. Oh that’s fine! You don’t have to comment on everything (or anything) haha :) Glad you liked it and that you’ve had a good, creative summer! This looks .. YUMMI . …. I will try this one tonight but first need to run to the local farmers market.